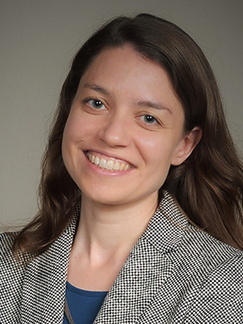 Caitlin Caspi, ScD, joined the University of Minnesota Family Medicine and Community Health research faculty in 2014. She was a fellow in the University of Minnesota Cancer-related Health Disparities Education and Career Development Program where she explored the social and physical environment as a determinant of health behaviors in low-income urban residents. Caspi also conducted research at the Dana-Farber Cancer Institute in Massachusetts for six years. She earned her ScD from Harvard University in social epidemiology. 2018-2023 NIH/NIDDK R01, Principal Investigator: “A Natural Experiment Evaluating the Effect of a Minimum Wage Increase on Obesity and Diet-Related Outcomes"
Caspi CE, Lenk K, Pelletier JE, Barnes TL, Harnack L, Erickson DJ, Laska MN. Food and beverage purchases in corner stores, gas-marts, pharmacies and dollar stores [published online ahead of print Sep 19, 2016]. Public Health Nutr. Caspi CE, Tucker-Seeley RD, Adamkiewicz G, Roberto CA, Stoddard AM, Sorensen GC. Food hardship and obesity in a sample of low-income immigrants [published online ahead of print Feb 12, 2016]. J Immigr Minor Health. Caspi CE, Davey C, Nelson TF, Larson N, Kubik MY, Coombes B, Nanney MS. Disparities persist in nutrition policies and practices in Minnesota secondary schools. J Acad Nutr Diet. 2015;115(3):419-25. Larson N, Davey CS, Coombes B, Caspi C, Kubik MY, Nanney MS. Food and beverage promotions in Minnesota secondary schools: secular changes, correlates, and associations with adolescents' dietary behaviors. J Sch Health. 2014;84(12):777-85. Caspi CE, Dennerlein JT, Kenwood C, et al. Results of a pilot intervention to improve health and safety for healthcare workers. J Occup Environ Med. 2013;55(12):1449-55.